52.5 inches wide and 21.4 inches deep. 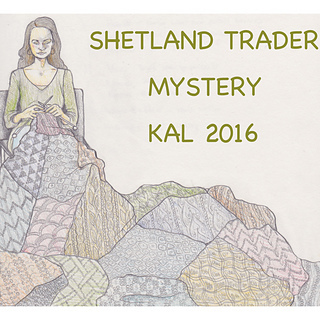 The Shetland Trader 2016 MKAL shawl is now available as a regular pattern. Please note that the pattern is 10 pages long. Not all pages necessarily need to be printed out. 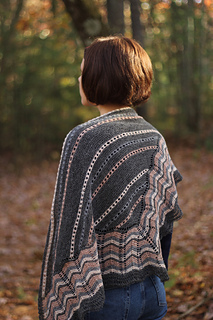 The first section of the shawl is knit using a traditional Shetland style center triangle. There are two options offered for how to work this section. 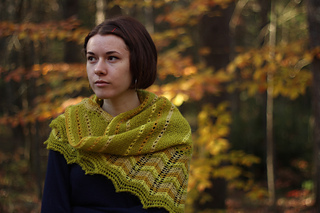 One uses yarn overs at the beginning of each row (Center A) and requires that you spit splice in new colors as they are needed. If you prefer not to spit splice, or are using yarn that doesn’t work well for splicing, then you can use the second option (Center B). 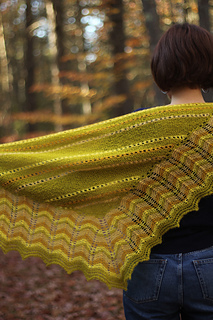 There is a fair amount of give when it comes to blocking the shawl. MC 340 yds, CC1 115 yds, CC2 100 yds, CC3 100 yds. 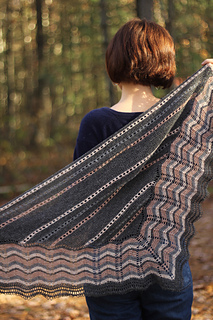 Center B version shown in Jurtalitad Einband by Hespa (100% Icelandic Wool; 273 yrds/50g) in four naturally dyed shades. 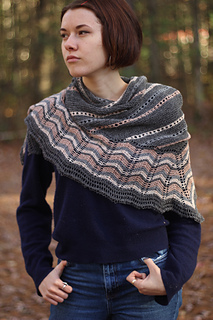 20 sts and 40 rows = 4 inches in Garter Stitch on US 6/4mm needles. Note: This gauge is after an aggressive blocking.